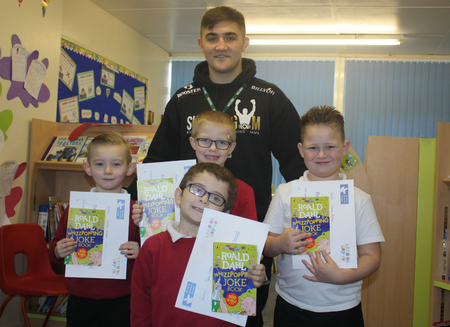 Suggy’s Gym’s Regis ‘The First’ Sugden took time out from training last week to join nine Year 2 and Year 3 pupils at Newark’s William Gladstone Academy taking part in Read Aloud Month. Designed to increase awareness of children who previously struggled to learn to read and to celebrate their achievements, the national campaign was run by the International Literacy Centre in conjunction with Save The Children. Pictured above with Year Two pupils (back, from left) Harrison Morgan, Mackenzie Lowe and Warren Bentley, and (front) Tyla Locke, Regis listened to each of the children read and then told them how important reading had been to him, before presenting them with books and certificates. “I had a great time reading with them and really enjoyed helping them out,” said Regis after his visit to the school.